Christine Sun Kim, The Sound of Anticipation, 2016, charcoal on paper, 19 1/2 x 25 1/2". 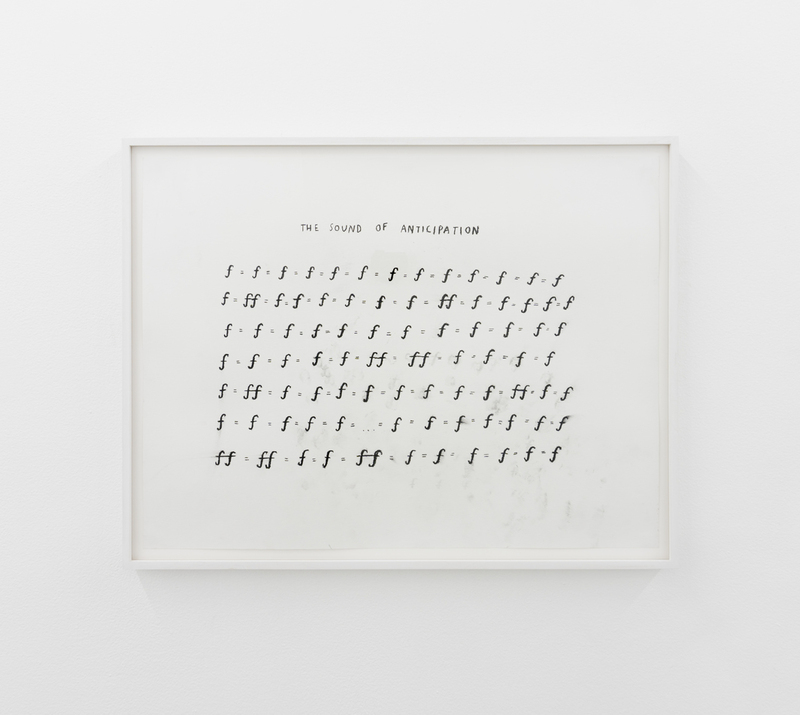 In the eighteen drawings on view, Kim expands on her visualizations of words and sounds, incorporating quantitative symbols and musical shorthand (such as “p” for piano [soft] and “f” for forte [loud]) to translate various experiences—for example, movie scores. The works’ titles are often associated with particular emotions, as in The Sound of Anticipation, 2016, and Suspenseful Background Music, 2016. This may be because ASL relies on facial expressions in a way that spoken English does not. The spacing of Kim’s mark-making evokes measurements from a seismograph, where lines that abruptly turn upward connote urgency while elongated lines connote grace. Viewed cumulatively, Kim’s notations gesture toward the gulfs of alienation and consent that can be sensed between languages. Yet that gesture is at once challenging, playful, and accessible—this alphabet is best understood by feeling your way around it, seeking embodiment.